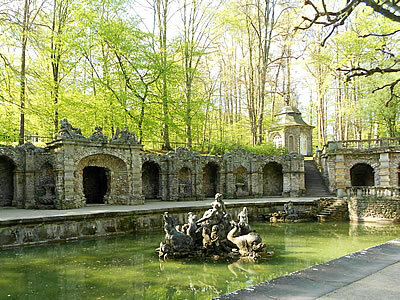 The Eremitage Palace - 'Hermitage' in English - is a short drive or bus ride to the east of Bayreuth along the Königsallee. It was once the summer retreat of the local nobility and was originally constructed at the beginning of the 17th century. In those days, a 'hermitage style' palace was designed as an escape from the cares and worries (usually about money!) of the world where the nobility could indulge in a fantasy 'back-to-nature' existence. The Palace was greatly extended in the mid-18th century by the Margravine Wilhelmine, the sister of Frederick the Great. After her marriage to the Margrave of Bayreuth she threw her energies expanding the cultural life of the area, with the building of a new opera house and with the completion of the Hermitage complex and grounds as they can be seen today. The usual means of access to the grounds is via the car park and the adjoining water gardens to the south of the principal buildings. 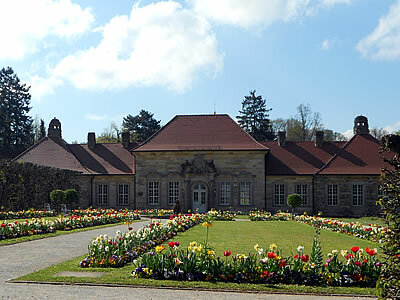 The gardens lead through to the New Palace, built by Wilhelmine in a semi-circular design with a Temple of the Sun at the centre. The arms of the building protect a terrace and large pool with fountains. Heading downhill from the New Palace into the woods, the path leads towards the Lower Grotto, with a pool and fountains. From there a path heads uphill again to the base of the Cascades, which were reconstructed in the 1980s from the original plans. This is another water feature running down a hillside. The climb leads to the Old Palace - as the name suggests, the oldest part of the complex. It is possible to take a tour of the palace rooms during the summer months. A number of features are also located around this area: a wooden chapel and artificial recreations of Virgil's tomb (which houses Wilhelmine's dog!) and a Roman theatre. What used to be farm buildings near the palace have now been restored and turned into a hotel and restaurant. The buildings are open in the summer but it is possible to visit the gardens year-round.